The very end of the world, the previous series, presented in five articles the general history of St Kilda, since prehistory to this day. This new series is about everyday life of men who lived in the archipelago. Life, north of the world, brings indeed, an exceptional testimony of the long occupation (more than two thousand years) of a territory submitted to extreme climatic conditions. Here is the first part. Everyday life in St Kilda is a permanent challenge for Hirta’s inhabitants. Hostility of natural elements makes this occupation an example of the ability that human being has, to get used to the most extreme environments. Imagine St Kilda. Imagine a few small islands, lost in the North Atlantic, around ten kilometres from the Scottish shores. Imagine those desolated lands, beaten by the wind, harassed by waves, bitten by the cold, colonised by birds. Imagine those formidable coasts you can approach only when the weather is quiet… However, this is where some men are going to settle and decide to build their lives. What do those people live off, in the island, north of the world, for thousand years? Archaeology brings some parts of the answers. The visible buildings and discovered remains present structures of constructions dedicated to storage. Agricultural marks of growing have also been brought to light as well as Cleitean (little buildings made of stone used as warehouses) and of course the traditional houses made of stone (black houses) which can be admired in Village Bay and which constitute the typical housing in the Highlands. All this is characteristic from a subsistence economy which tries to meet a need of a little isolated community. The first food singularity of St Kilda’s inhabitants is the massive consumption of eggs and birds. Indeed, generations could succeed each other in the archipelago mainly thanks to this abundant resource. Islanders revealed a remarkable skill to hunt and pick the eggs of Northern gannets, puffins or fulmars. For that, men fasten themselves with ropes and went down along the breathtakingly high cliffs. Thus, they could visit inaccessible nests and catch the birds with fishing rods, before eating them raw, dried or salted. This hunting technique was particularly dangerous and was considered as a rite passage for young men to adulthood. The one who wanted to prove he was worthy of marrying a woman should prove his skill to hunt birds on the cliffs from Mistress Stone, a door-shaped opening in the sheer rocks in the ocean. 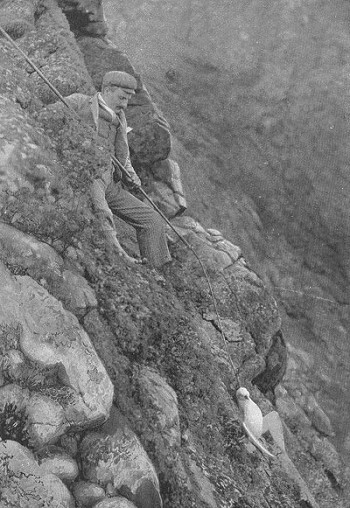 The following video was shot in 1908 in St Kilda. It shows men fishing birds in action. An exceptional testimony of everyday life’s islanders. In addition to birds, islanders also had some bovines and cultivated with difficulty some lands to produce barley and potatoes. Nevertheless, farming remains limited. Indeed, they had to irrigate, and the lack of water resources was a real obstacle to agriculture development. We must also keep in mind the weak surface and the important escarpment of lands to explain the weakness of agricultural productions in St Kilda. The use of fertilisers made from birds’ dejections caused serious health problems as well, in the island. A last, Hirta’s inhabitants grew sheep to provide milk, meat and wool, necessary resource to be protected against the northern harshness. Despite the omnipresence of the ocean, Hirta’s inhabitants ate few sea products. Fishing was limited because of the difficulties to come alongside by boat. Indeed, the ocean, often rough around St Kilda, makes sailing hazardous. And without any woods on the island, damage was almost irreversible. The coasts of the islands almost did not provide seafood, which reinforced the islanders in their singular diet. Don’t even talk about fruits, they just do not exist on the archipelago. So on St Kilda, nutrition is a constant worry for the community throughout its presence on the island. If they survive thanks to their skill to make the best from a hostile environment, the inhabitants regularly know privations because of the too limited resources. Periods of starvation are not rare in the archipelago. 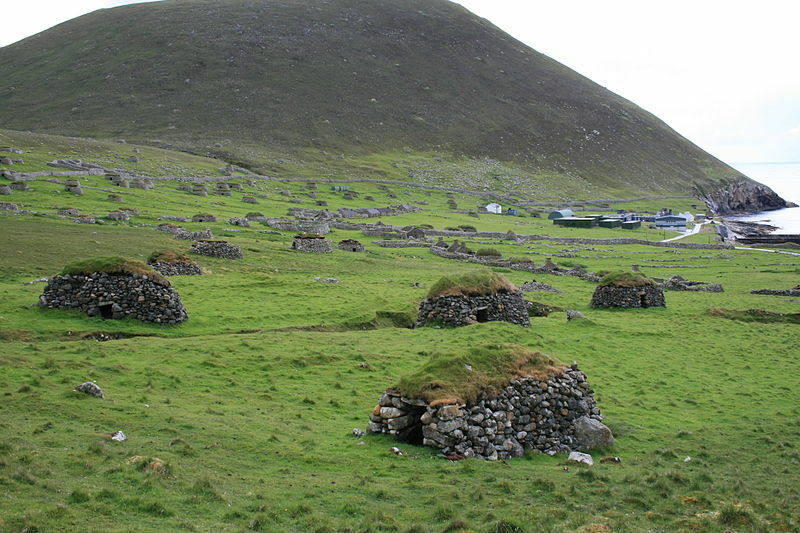 In those conditions, it is not really surprising that Hirta’s population always stayed under two hundred souls. Tags: Fishing birds, St Kilda, St Kilda birds hunting, St Kilda history. Bookmarquez ce permalien.